My laboratory studies malaria, with a goal of developing new treatments for this disease. Our research focuses on the first step of malaria infection, when parasites infect the liver. We are also very interested in understanding the last phase of malaria, when parasites exit humans via transmission to mosquitoes. A better understanding of these processes may enable the development of novel treatments that reduce the devastating effects of malaria globally. Our laboratory is interested in understanding how malaria parasites manipulate their intracellular environment in order to live within humans. How the parasite enters liver cells. How the parasite survives inside liver cells. How the parasite is transmitted to, and develops within, mosquitoes. Our recent research has focused on how malaria parasites commandeer red blood cells by exporting their own proteins into these cells. This has revealed potential new targets for antimalarial treatments. We are very keen to see whether these parasite targets are also active during the earliest and last phases of malaria in the human host, in order to intercept the parasite at multiple stages of its lifecycle. We use cell biology and biochemistry to study the parasite and its interactions with the host. We also utlise the institute’s new insectary, in which Anopheles stenphensi mosquitoes are reared and can be infected with P. falciparum, P. vivax and P. berghei parasites. 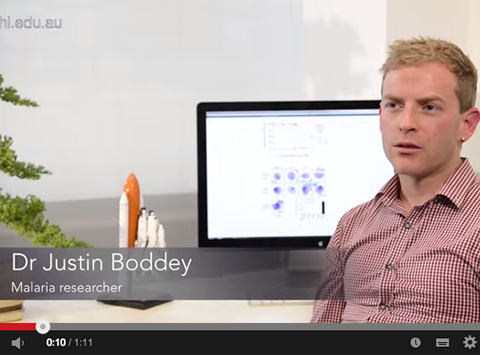 We use in vitro and humanised models to study malaria-host interactions across the lifecycle. Our research also involves the development of small molecule inhibitors for use as tools to understand the role of protein export across the lifecycle, and also for potential use as antiparasitic therapies.